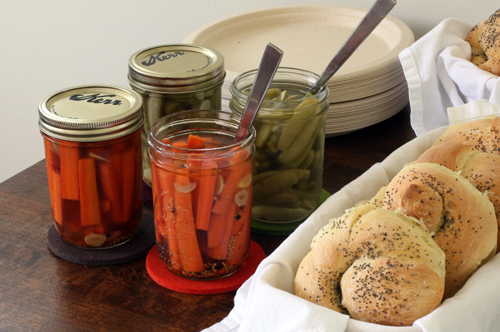 Have you ever tried pickling? I hadn’t either, until a couple of weeks ago. Hadn’t even really thought about it until finishing Molly Wizenburg’s A Homemade Life a couple of weeks before that. The timing was perfect. I’d been thinking about our upcoming barbeque, flipping through magazines and cookbooks trying to decide what to make. Our overall plan was simple - we would provide all of the makings for pulled pork sandwiches, some snackie appetizers and, of course, dessert. Our guests would each bring a side dish to share and beverages of choice. Easy, cost-effective, everybody gets to contribute AND you learn about some great new salads for future summer parties. However, when you’re throwing a party and only contributing a few key dishes to the event, the pressure is on to make those dishes shine. Especially if your name is Andrea and you write a food blog. It isn’t outside pressure; its completely internal. I do it to myself, and not because I feel the need to impress my guests (which is a nice bonus, if it happens), but simply because I don’t get many opportunities to cook for that many people. Smoking a 10-pound pork shoulder for 10-12 hours isn’t something that Brian and I do every weekend, as nice as that sounds. And I certainly wouldn’t make 24 cupcakes on a whim without a special occasion or at least an office full of male co-workers to take them to. So, when given an excuse to prepare something indulgent or time-consuming, I jump. And start planning weeks in advance. The pulled pork was an easy decision, we’d been wanting to try something similar for quite some time. I left Brian in charge of consulting with the local farmer that supplied the shoulder (Double H Farm - fabulous people and Big Green Egg owners as well!) and finding the right vinegar-based barbeque sauce recipe to go along with it. The cupcakes were much more difficult - I was emailing back and forth with my cupcake consultant the day before the party, still trying to determine the perfect frosting for those decadent cakes mere hours before I was planning to make it. 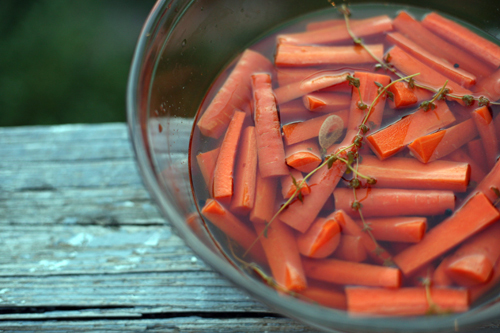 Luckily, I had decided on the "snackie appetizer" portion of our food contribution weeks prior, and the sugar snap peas and carrots had been nestled in their brine, resting in our fridge for a full five days. 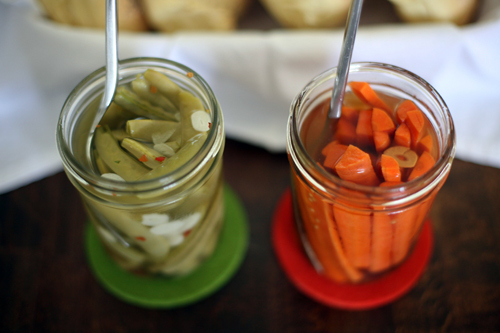 Many thanks to Whitney for introducing me to the pickled sugar snaps recipe, and Molly for the carrots.